The wait is over! Summit Artspace Gallery and guest curator Brian Shellito, after organizing a unique outdoor art experience this summer for artists and the public, the works from that outdoor art experience are on display at Summit Artspace Gallery. The exhibition will run through September 15. Streetscapes 2012: Akron in Plein Air will, for the second time, bring together talented local artists to paint urban landscapes along downtown Akron streets. Spectators were encouraged to visit the creative work sites and witness the process. 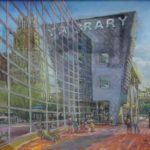 In addition to the Streetscapes: Akron in Plein Air exhibit, Summit Artspace is celebrating its 10th anniversary and postcards donated by artists who have shown in previous exhibits over the past ten years will be on display. Each postcard is ten dollars and proceeds go to benefit the gallery. 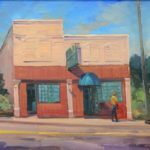 Summit Artspace Gallery has put on over 40 exhibitions over the past ten years featuring many local artists. 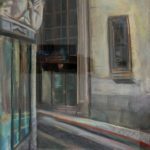 Streetscapes: Akron in Plein Air, second place, Mina Huang, “Love the Library,” pastel. Show card artwork by Mina Huang.